As a lawyer, I count on accessories to make me stand out from the other "suits." Jewelry, Handbags, and, of course, Shoes. 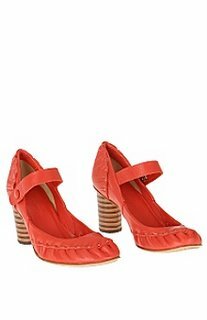 These glamorous Lipstick Mary Janes with striped conular heels by Georgina Goodman are another slam dunk from Anthropologie and a fabulous and easy way to feminize a pantsuit. At $298 though, I will have to wait until they go on sale. Sigh.